A year of fundraising initiatives has resulted in business transformation company TORI Global raising £50,000 for Central London Samaritans. TORI Global announced that it has raised £50,000 for Soho-based charity Central London Samaritans (CLS). This was achieved through support from family, friends, clients and partners. The largest contributor to the fundraising effort was a charity race day hosted by TORI Global at Chepstow Racecourse. Along with a very successful raffle and auction, the day raised a huge £15,000. TORI also took part in a 12-hour bike ride in Charing Cross Station where employees rode for 12 hours straight in 30 minute slots. TORI rode with 7 other supporting companies and with the generosity of commuters and passers-by, the day raised over £13,000. TORI also received support for their charitable efforts from their partners. 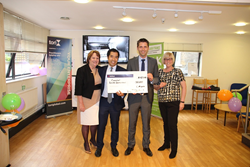 Executive search company ‘Simply Executive’, who TORI work closely with, contributed over £9,000 over the year. Other initiatives included a golf day and help from local restaurants. Along with the 12 months of fundraising, TORI also facilitated workshops with senior trustees and the Operations team at the charity to look at developing fundraising strategies and streamlining operational costs. At the end of the financial year 2015/16, both TORI and Central London Samaritans hit their fundraising targets and as a result CLS have been able to meet their operational costs, kick-start a new awareness programme, invest in a new volunteer management tool and upgrade the building facilities at the CLS Centre, Soho. Jin Chin, Chair of Central London Samaritans, commented "It's been a real pleasure working with TORI Global over the last year. Their support of Central London Samaritans at a challenging time for our charity has been fantastic. Not only have they helped out by shaking buckets, taking on challenges and organising their own events but they've also provided us with insight and expertise at a time of change for our organisation. Our thanks go out to Martin and Sue Harvey and their team for all their enthusiasm and tireless support!" Samaritans is a helpline charity who provide emotional support for people experiencing distress and despair. Central London Samaritans was the first branch of the charity to open and has never closed in 60 years. The national, volunteer-led, helpline charity was started by Reverend Dr. Chad Varah CH CBE in 1953, following the tragic suicide of a young girl in his congregation. From these beginnings in the City of London, today the Samaritans' national movement comprises 201 independent branches across the country and one central charity. TORI Global was formed by a team of practitioners with extensive experience working at a senior level for large firms across multiple regions. The founding partners sought the ‘ideal’ consultancy when working as CIO, CTO and Executives. TORI was created to embody that ideal and combines all the required components to digitise, run, control and change large complex technology and operational environments. TORI was awarded 29th place in the Sunday Times Hiscox Tech Track 100 2015. The highly respected league table ranks Britain’s fastest growing technology businesses in the UK. For more information at TORI, visit the website at https://www.toriglobal.com/ or contact 0207 025 5555.